This chicken is so flavorful! It’s one of the yummiest things I’ve made in my crock pot, lately. 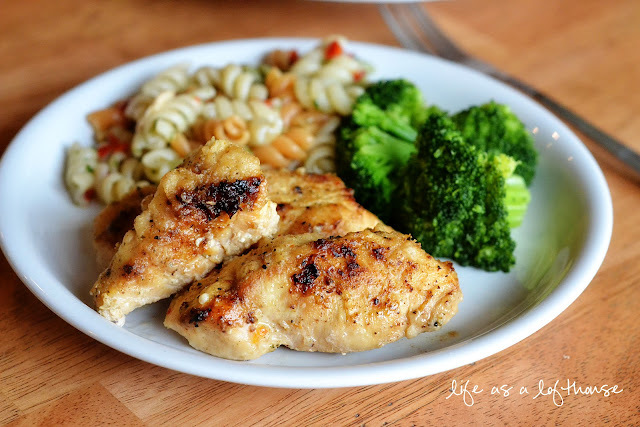 Lemon chicken with a hint of Italian seasonings. Mmmmm so good! I decided to pan fry it first to get a nice brown coating, and then threw it in my crock pot with some Italian seasoning, lemon juice and chicken broth. As it cooked, it filled my house with an amazing lemon scent! Rinse the chicken pieces with water, and then lightly coat them in the flour. Set aside. Plug in crock pot and turn setting to Low heat. Heat 2 Tablespoons of butter in a large non-stick skillet, over medium-high heat. 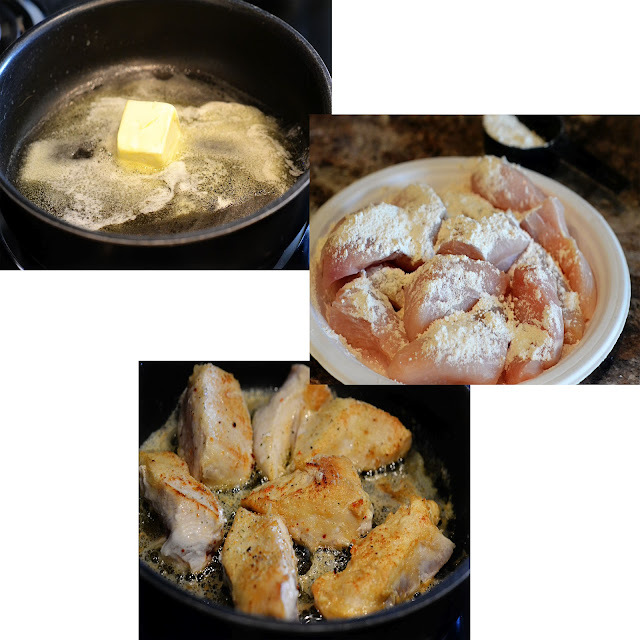 When butter is melted, add half of the flour-coated chicken pieces. (You don’t want to over-crowd the pan, so you’ll cook the chicken in two batches) Season with salt and pepper. Cook chicken for 3-4 minutes or until golden brown,on each side. 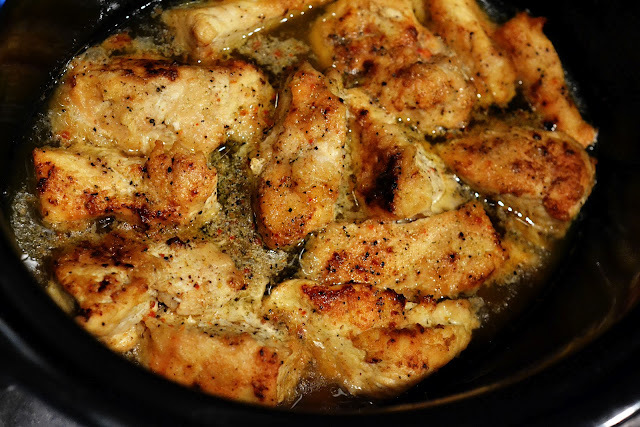 Remove chicken from skillet and place in crock pot. 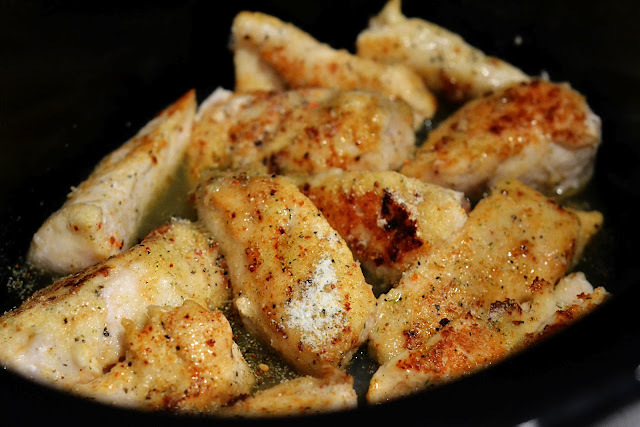 Add the 2 remaining tablespoons of butter in skillet, and cook the remaining flour-coated chicken pieces on each side for 3-4 minutes or until golden brown. 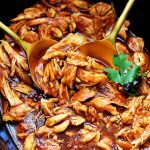 Remove chicken from skillet and place in crock pot. Sprinkle the Italian dressing/seasoning mix evenly over the chicken. Pour the lemon juice and chicken broth over the tops. Cover with lid, and cook on low heat for 3 hours. Either serve chicken pieces whole or shredded, with the lemon sauce/broth. Enjoy! Love step by step pictures, I am not a meat person. Don’t really eat it, don’t know how to cook it well… so I almost skipped this recipe, but seeing the pictures… never even would have thought to use a paper plate and pour the flour on top. I was thinking I was going to have to touch it and rub it, and then you lost me. But now I’ll give it a try! Thanks Holly! You can also put the chicken and flour in a container, my Mom always used a paper bag, and shake it. That coats the chicken very nicely. Love the sound of this! A perfect meal with pasta and veggies! LOVE you new header. And I love slow cooker recipes. This recipe is right up my alley! I am in LOVE with this! 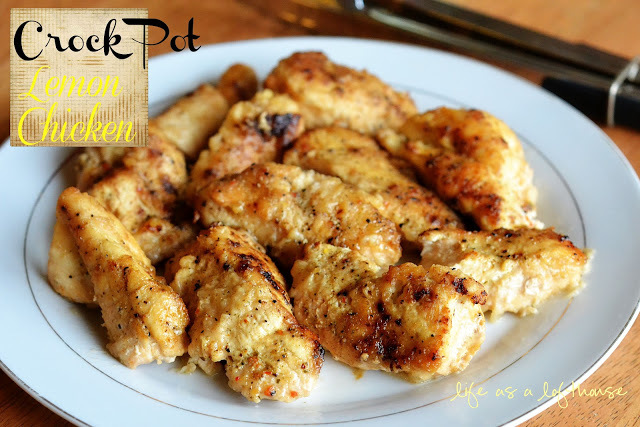 I’m kinda obsessed with easy crockpot chicken recipes right now and I’m so making this next week! I can tell by your wonderful pictures and description that this is going to be a favorite of mine! Thank you for always sharing such great recipes! This sounds and looks amazing. I’m always about easy too. YUMMERS!! I think the best think about lemon chicken is the yummy sauce to pour over, dunk into…This looks yummy, and the crock pot makes it such a cinch. I’m trying this one soon! WOW! Oh yum! Thanks for sharing this great recipe, can’t wait to try it! 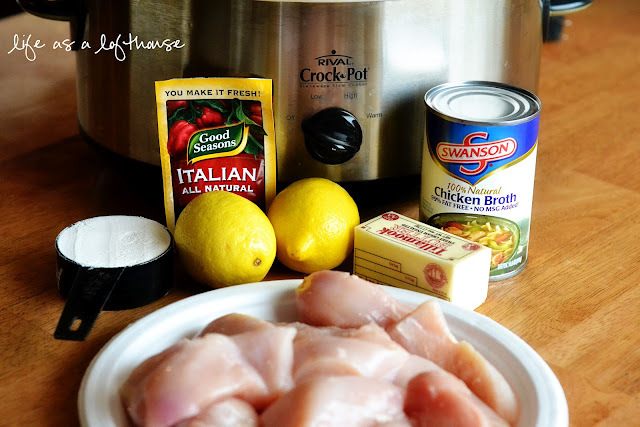 Should there be enough broth to completely cover the chicken in the crockpot.? Made this for my husbands birthday dinner and served it with garlic and red pepper broccoli and egg noodles with butter. He totally enjoyed it. I used meyer lemons and it gave it a nice amount of sweetness! In your picture it looks like you seasoned the chicken while it was frying and didn’t wait until it was in the crock pot. Do you recommend this? i JUST MADE THIS CHICKEN! IT WAS DELISH! I TOTALLY RECOMMEND! I am making this now! For reals. Yum. I’m planning to double this recipe… Any thoughts on whether the cooking time will need to double as well? Lori, if you’re doubling the recipe, I’d cook it for 4-5 hours! This looks excellent! we have friends that don’t eat red meat so we are always looking for new chicken recipes – THANK YOU! Is rice ok? Instead of pasta? This look delicious. Can’t wait to try it. Love crockpot recipes. Ooh, I do believe I will be trying this recipe this coming weekend. 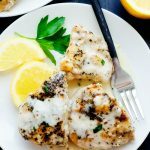 My kids love lemon chicken that I marinate and grill, but now that it is getting colder outside I won’t be grilling. The chicken looks so juicy in the pictures. I can’t wait to try it! Thanks for sharing with us. This recipe is not printer friendly. I’d love to make this for my Bunco group, but one one them has celiac disease. what’s a good fluten-free substitute for flour? any idea of caloric content?? This was terrific! I sauteed the chicken in olive oil instead of butter. When I do this over again, I’ll use low or no sodium chicken broth and I would add some herb seasonings that didn’t have the high levels of sodium in the Italian Seasoning packet. Also, I found that my chicken was done in 1 hr 15 minutes at a low setting. This looks so delicious! I’m going to try this tonight. Thanks for sharing this!